These receiving blankets are amazing. Double layered for extra coziness, and unlike store-bought receiving blankets they actually ARE useful and can be wrapped around your whole baby! They are perfect for swaddling. They are such a great size I still use them every night in my one year old's crib. When we were camping recently it was SO freezing cold, but we had several of these blankets with us and with one on my legs it saved the day (or night!). I am now on a mission to buy two good size flannel sheets and make one for my own bed for this winter. 1. Pre-wash and iron your fabric. 2. Lay your first piece of material flat, right side up, on a large enough surface area, and use masking tape to secure corners. Flannel can be very difficult to keep flat and I picked this tip up online which really does help a little. Lay your second piece of material centered on top of the other, with the wrong side up. Pin pieces of material together all the way around the outside edge. 3. Machine stitch around outside, 1/2 inch from raw edge of fabric, leaving one gap large enough to fit your hand in. 5. 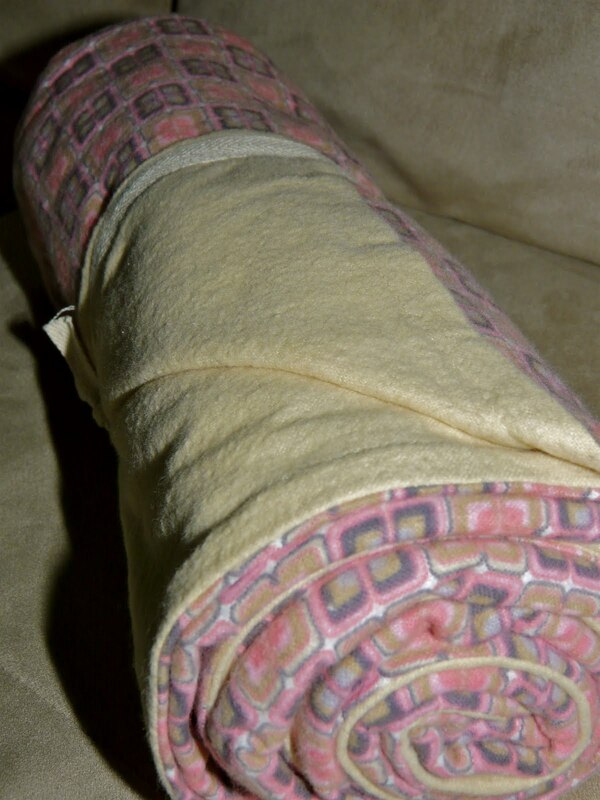 Using the opening, stick hand in and turn blanket right side out. 6. Go around the outside edge of the blanket, pressing it lightly with an iron, and securing it with pins making sure to fold in the unstitched opening so it looks equal. Hand stitch edge of the folded in opening using a slipstitch, or other subtle stitch. 7. Stitch around entire blanket within 1/2 inch from the edge so you are sure to secure the raw edge on the inside making for a stronger blanket. Obviously you can also zig zag or serge the raw edge before turning in, but of all the blankets my mom has made me (and for how much use they have had) I haven't had any come apart.